Onions are one food of truly time-tested value. Onions have been cultivated for some 4,000 years, probably originating near present-day Afghanistan. Because onions are small and their tissues leave little or no trace, there is no conclusive opinion about the exact location and time of their birth. Many archaeologists, botanists, and food historians believe onions originated in central Asia. Other research suggests onions were first grown in Iran and West Pakistan. Today, this hardy member of the lily family is among the most widely traded vegetables in the world. From soufflés to sour cream dip—versatile onions go in and with dishes throughout the menu and across cuisines. The famous chef Julia Child once remarked “I cannot imagine a world without onions.” This was no mere hyperbole on the part of the Francophile chef, but a discerning assessment of a vegetable that has captured popular imagination. During the time that man has cultivated them, onions have put down roots in religion, folklore, sexuality, culture and literature, and have even influenced the course of history. Clearly, the onion is more than a kitchen staple. It is a world-class superfood that has received very little fanfare, most likely because of its common position in cookery. Once upon a time there was a town composed of two parallel streets. A Dervish passed through one street into the other, and as he reached the second one, the people there noticed that his eyes were streaming with tears. “Someone has died in the other street!” one cried, and soon all the children in the neighborhood had taken up the cry. What had really happened was that the dervish had been peeling onions. Within a short space of time the cry had reached the first street; and the adults of both streets were so distressed and fearful (for each community was related to the other) that they dared not make complete inquiries as to the cause of the furor. This rumor, too, spread like wildfire, until each street’s populace thought that the other was doomed. When some measure of order was restored, it was only enough for the two communities to decide to emigrate to save themselves. Thus it was that, from different sides of the town, both streets entirely evacuated their people. Now, centuries later, the town is still deserted; and not so far away are two villages. Each village has its own tradition of how it began as a settlement from a doomed town, through a fortunate flight, in remote times, from a nameless evil. Just the same, onions are misunderstood, blamed for everything from bad breath to stale odors. As with people, an onion’s qualities arise from a combination of heredity and environment. With understanding, you can defuse the onion’s challenging personality to make use of all it has to offer. The Onion is one of civilizations oldest medicines. It is because of health benefits of onion, that in ancient Mesopotamia, onion was believed as cure of all illness. Physicians in Ancient Egypt prescribed onion on various diseases and it was considered a stimulant, diuretic, expectorant and rubefacient. Leaves of onion are diuretic, carminative, digestive, emmolient, tonic, antispasmodic, mild laxative and aphrodisiac in nature. The word ‘onion’ comes from the Latin unio, meaning oneness or unity, because an onion, like a union, is destroyed as it is gradually taken apart. The most notable features of onions—their layers, papery skin, and ability to produce a parody of affect—have made them a rich source of symbolism and inspiration for religious and folk traditions. The onion has alternately been considered sacred and profane within the same culture. The ancient Egyptians worshipped onions and believed that their concentric rings symbolized eternal life, even burying some pharaohs with onions. Beneath the skin of an onion lies a battery of unusual chemicals. Some have a familiar effect – assaulting the tear ducts or tantalizing the tastebuds. But scientists are beginning to find that there are many more interesting chemicals in an onion. Health benefits of onion include relief from various diseases including respiratory disease, tooth disease, heart disease, sexual impotence, skin disorders, diabetes, high blood cholesterol, viral diseases, cholera, ear infections, rheumatic diseases, blood clots, body ache, urinary system disease, dsymenorrhoea and others. I don’t know about the farmer’s story…but, I do know that Last year the UK’s 15 million hay fever sufferers braced themselves for what was forecast to be one of the worst pollen seasons ever; however there was some welcome news from an unlikely source – the everyday onion. 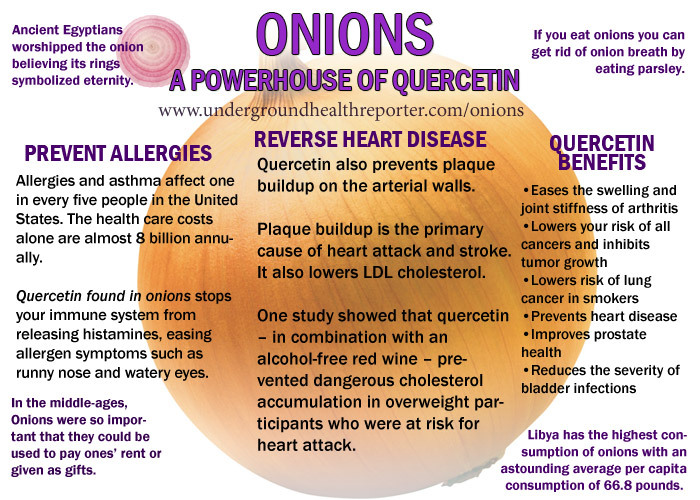 Onion skins contain quercetin, a potent natural anti-histamine and anti-inflammatory shown to help hay fever sufferers, according to Dutch researchers. Onions contain three times as much Quercetin as Kale – the next-richest source – and 10 times as much as Broccoli– but any amount of onion will help. The onion analogy, sometimes called the “onion theory” of personality is like a multi-layered onion with public self on the outer layer and private self at the core. Some say that this personal transformation work is like peeling layers of an onion. That might be because it can cause you to cry a lot. The onion is used metaphorically to describe sequentially removable layers that conceal an important something. That is, when we use a metaphor involving an onion – such as “peelingaway another layer” – we visualize a central concept (a heart or core) that is buried beneath an organized series of increasingly central issues or arguments. There is nothing of material value between each layer of a metaphorical onion: it is treated as skin upon skin, fortification upon fortification. When an “onion of a story” is formed, we beckon for that certain something that one is “hiding from us”, “not letting us in on”, “not disclosing” or “not revealing”. We will approach the matter “from another angle”, in the hopes that this will reveal underlying issues or help us gain further insight. And we may often angrily say “chaff!” when rejecting a given unwanted layer, as if an onion is a scintilla of nutritious truth surrounded by unwanted, unpalatable, irritating dross. In the onion metaphor, that which is not deemed the central truth has no lasting value. When we “get to the bottom” of something – finding its “root” or “kernel” of truth – we are finally exposing that which is most shielded from view. This differs from “opening one’s eyes” or “letting some fresh air in”, in that the onion offers a series of seemingly valid mistruths, rather than a singular misconception. This also differs from a “higher truth” in that each step in a heightened understanding does not totally invalidate the prior; rather, it reveals that it was simply incomplete. One progresses inward in understanding from surface issues to deeper truths. And, only by peeling its many layers, can one reveal whether it has a sweet heart or a rotten core. This entry was posted in Uncategorized and tagged ancient egypt, Central ASia, Civilization, consciousness, education, enlightenment, Food HIstorians, health, Julia Child, Know Thy Self, Knowledge, life, live, nature, Onion, philosophy, Quercetin, Science, Ted Talks, The Food Doctor, universal, www youtube. Bookmark the permalink.